In this Octave of Easter celebration, we contemplate God the Father’s gift to us, His beautiful Son, Jesus, and the gift Jesus gave to us – His life. Consider the abundance of gifts Jesus left behind so that we would know He is still with us. The gift of faith, which moves us to seek His presence. The gift of grace, the Holy Spirit living within us. The gift of forgiveness, so that we may be washed of every sin. Even greater, the gift of His physical presence in the Eucharist, which is what today’s Gospel writing of Luke teaches. Out of this sacramental gift comes His greatest gift – eternal life! Luke describes the first physical presence of Jesus after His death and resurrection. While His disciples were discussing how they recognized Him in the breaking of bread, Jesus appeared to them in the flesh – what timing! But they were terrified, seeing Him alive after He had been dead, so Jesus left yet another gift – His peace; “Peace be with you,” He said, comforting them. They thought they were seeing a ghost, but Jesus reassured them, showing them His hands and feet, “Touch me and see, because a ghost does not have flesh and bones as you can see I have” (Luke 24:39). We too, can recognize Jesus in the breaking of the bread and be assured of His physical presence. 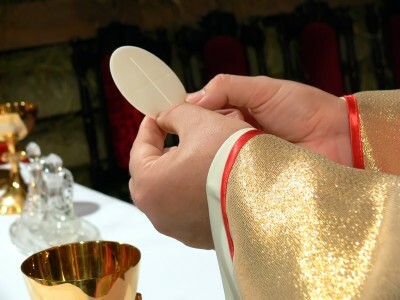 Just as Jesus invited His disciples to “Touch me and see,” we can invite Jesus to “touch me” each time we receive His very body and blood in the Eucharist at every Holy Mass.